On the slopes of the Valjevo mountains in Western Serbia, at the ideal height above the sea level and under the specific microclimatic conditions, which are more than suitable for growing grapevine, Milijan Jelić founded his winery in 2002. Vineyards extend over several locations near Valjevo. Over the total area of over 20 hectares, the dominant grape varieties are: Morava, Chardonnay, Sauvignon Blanc, Pinot Grigio and Petka from the whites, Pinot Noir and Merlot from the reds. After experimenting with some of other worldwide famous varieties, Milijan Jelic decided that the main varieties in the vineyard should be the local ones Morava and Prokupac. 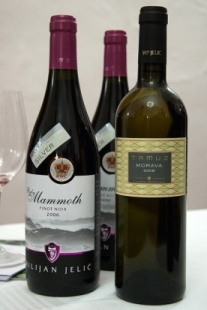 Soon after the first excellent results in 2004, it was undoubted that Morava could provide world quality and in a very short time it became very popular with domestic and international wine connoisseurs. The first commercial wine made of grape of this cultivar Tamuz Morava 2005 won the “Champion of White Wines” title already the next year, 2006, at the Novi Sad fair. Prokupac, however, has already confirmed its great potential in Serbia several times through wine of vintner colleagues and showed that under tough yield control in vineyards it can deliver elegant wines with an exceptional character. The winery is situated at the property in Bujacic, nearby the Jelić family house. The heart of the wine cellar comprises modern sections for processing grape, production, aging and bottling of wine. Apart from the underground space, the winery also contains two halls for degustation which are regularly visited by individual wine lovers, as well as organized tours with a lot of visitors. The spacious tasting room, with the semi-closed balcony and a vineyard view, equipped with audio-visual items, is used more and more as a multi-functional room for meetings, seminars or team building weekends for various companies. Catering for events is provided by the Jelić family restaurant "Tre Merli" which is situated in the centre of Valjevo. Apart from the many awards received for the wines, due to the full service offer, the Serbian Tourist Council awarded a prize "Tourist Flower 2009" to the Jelić winery in the "wine cellar" category.